Lost Lake trail walk. Incredible fishing off the main lake! Off to explore Wabaskang Lake! Bears, moose and wolves...oh my! 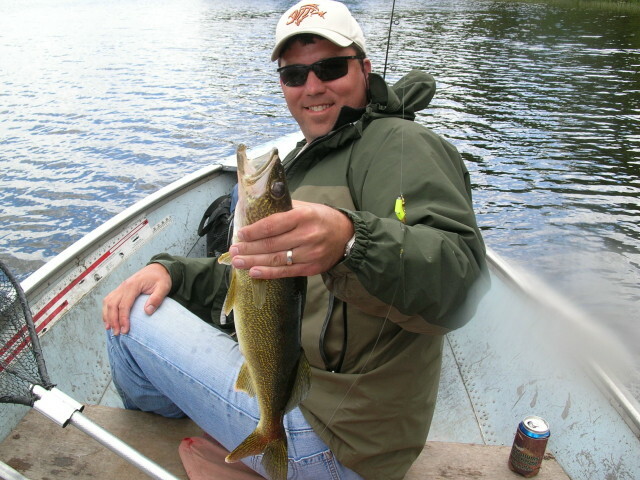 Fish as many as 10 other lakes from base camp via VERY easy boat or foot portages! Your wilderness adventure is ONLY beginning at our roadside dock where you (and your supplies) will be picked up in a 21 foot all-weather Crestliner passenger boat for a safe and comfortable ride out to camp. Leaving the noise of the highways and the distractions of everyday life behind us, you will enjoy the 20 minute, 12 mile scenic boat ride to camp. On the way, keep your eyes open for the variety of wildlife the area has to offer including: Loons, mergansers, eagles, moose, bear, wolves, otter, and beavers. 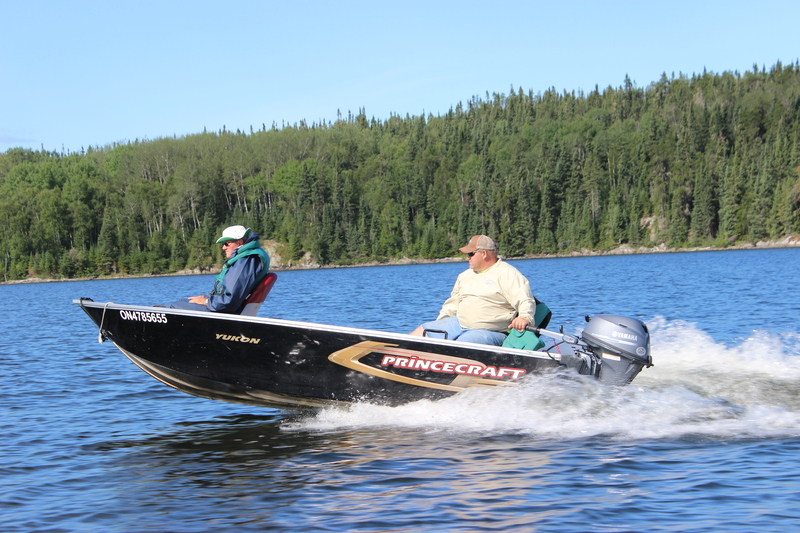 Enjoy the Canadian Wilderness as we pass through the narrows, around the islands and over the open expanses of Wabaskang Lake on our way to camp. Feel the excitement build, as we leave the roads and enter the wilderness. Upon arrival in camp, you will be greeted by our friendly staff who will load all your gear into a luggage cart and transport it via a Can-Am Outlander XT 400 4X4 to the door of your cabin. No lugging your own gear here! Your 14 or 16 foot Naden or Princecraft boat will be thoroughly washed and waiting for you. 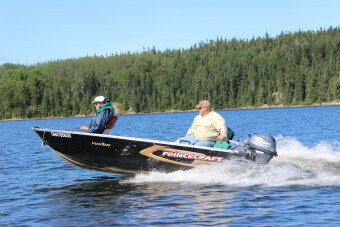 We have recently added several flat bottom, walk thru design Princecraft boats with 20″ transoms to our fleet powered by reliable 20 hp Yamaha four stroke engines. All our boats are equipped with deluxe high-back cushioned swivel seats, so even the longest day on the water will be comfortable. 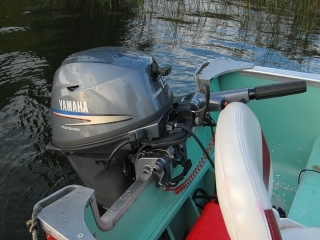 Unless you are portaging, you will access many of the quality fishing spots located close to camp in under 15 minutes. Our dock service is second to none-wake up in the morning with your boat gassed and baled from an overnight rain. As another wilderness adventure option, take a 20 minute trail walk thru the Canadian bush to Lost Lake. Once there, you will be the only group on this small 100 acre lake, and will experience some incredible fishing for trophy Walleye and Northern pike. 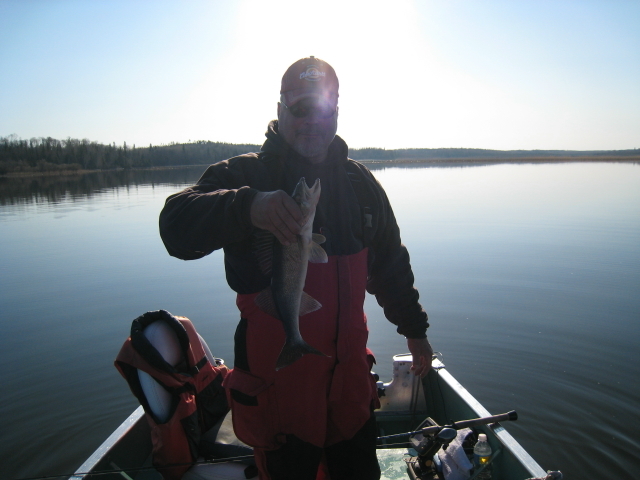 Due to the small size of this body of water, Lost Lake is a catch and release only lake, and the size of the fish there proves catch and release works! 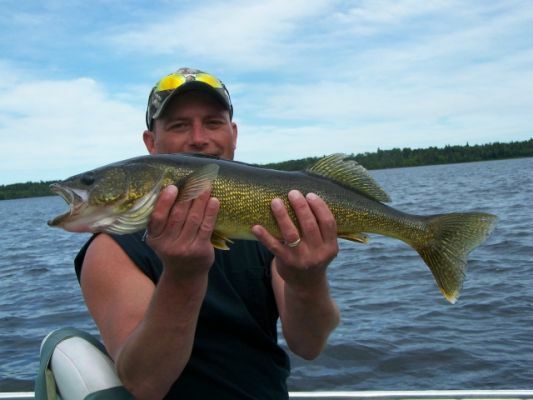 This jewel of a lake offers complete seclusion as you are the only ones on the lake and provides fly-in quality fishing with many, many trophy size walleye and pike caught and released there every year. 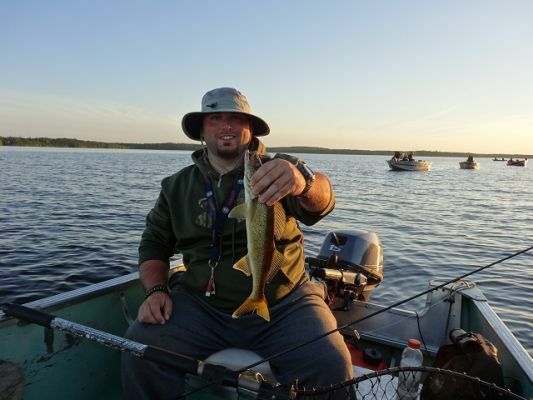 We have many, many guests experience 100 walleye days on this incredible fishery and have numerous groups that have experienced over 200 walleye days! This is an incredible trip and experience you won’t want to miss out on! For even more wilderness adventure, save one day for an EASY portage over Hobson Falls, leading you down the Anishinabi River to Wine, Beaver, Ghost, and Halverson lakes. This chain of lakes offers our guests an additional 12,000 acres of water to explore and fish. Wine Lake and it’s connecting waters are well known for it’s trophy fish potential. We do ask that our guests release fish of certain sizes on these waters.This is another adventure you won’t want to miss. Take along a shore lunch kit (provided by the camp), make a day of it and enjoy the quality fishing this water also has to offer. There are NO additional charges for any of our portage trips!